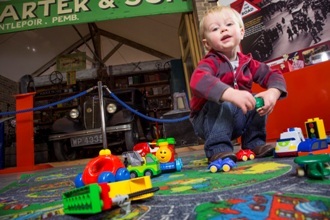 This spring the British Motor Museum is launching its new under 5's Mini Motorists mornings and themed Saturday Clubs. The Saturday Clubs run as four, six week, blocks of one hour sessions covering topics from engineering to coding. As well as developing the child's skills, the clubs also provide a fun and interactive environment where they can make new friends. The Computing Saturday Club runs from 4 March - 8 April. Children can expand their knowledge of computing and create their own 3D animation. The workshops will be staffed by ComputerXplorers, a specialist education technology company running computing classes and after school clubs, and the British Motor Museum Saturday Club Team. Parents will be given weekly update sheets which explain what the children have achieved and give tips on how to further their learning. The topics will be tailored to each age group and the Club will run from 10.30am - 11.30am for 5 - 8 year olds and 11.45am to 12.45am for 9 - 11 year olds. The Green Power Car Saturday Club runs from 17 June - 22 July. Children can learn about the inner workings of cars and test their engineering skills by building and racing a full size Green Power car on an outdoor track. The Museum have teamed up with Active Learning Support, a company formed to introduce children to STEM subjects in a fun and highly interactive way for KS2 and KS3 aged children. The topics will be tailored to each age group and the Club will run from 10.30am - 11.30am for 9-11 year olds and 11.45am to 12.45am for 11-14 year olds. The Robotics Saturday Club runs from 9 September - 14 October. Children can improve their knowledge of robotics and coding by building and programming working models. The Club is run in partnership with ComputerXplorers. The topics will be tailored to each age group and the Club will run from 10.30am - 11.30am for 5 - 8 year olds and 11.45am to 12.45am for 9 - 11 year olds. The Engineering Saturday Club runs from 4 November - 9 December. Children can learn about the inner workings of cars and test their engineering skills by building and racing a scale model remote control car on the specially designed race track. The Club will also be run in partnership with Active Learning Support. The topics will be tailored to each age group and the Club will run from 10.30am - 11.30am for 9-11 year olds and 11.45am to 12.45am for 11-14 year olds. The cost per child for each Saturday Club is £45 for a 6 week block with free entry to the Museum for one accompanying adult who must stay onsite for the duration of the Club. All Saturday Club staff are CRB checked. Mini Motorists mornings are aimed at under 5's and involve interactive activities and storytelling. The themed mornings take place on a variety of Mondays from 10.30am - 12pm, enabling parents and toddlers to explore the world's largest collection of historic British cars. The themed mornings run throughout the year from 20 March to 18 December. Under 5's go free and adults can 'buy one day and get 12 months free' when they gift aid their entrance fee. To find out more information about the activities, including dates, please visit the website at http://www.britishmotormuseum.co.uk or call 01926 641188.